One Last Nail in the Dead Files Coffin. I was surprised to get a message on my last post about The Dead Files episode of The Riverside Inn. 'R' gave me some examples of why he was unhappy with the show but since he included the names of people I know, I've decided not to publish it but I will address his concerns here. R was concerned that the Dark Files portrayal of the inn was harmful and pointed out its many inaccuracies. I figured anyone watching the show who was unfamiliar with the inn would realize this was like all other reality shows and nothing more than a way to gain publicity. I laughed through most of it and I seriously doubt anyone will stay away from the inn as a result of this episode. Actually, people used to ask me all the time why we didn't have ghost tours. R told me the inn was never for sale and it was given to the new owners in hope that it would continue on as it had for years. As far as I know the inn was definitely for sale (at least to anyone with a serious interest) and I remember one man who spent the better part of a year trying to buy it but for some reason that sale fell through. As for how the new owners acquired it, that's between them and the former owners. R pointed out that under the new ownership there have been several negative reviews on the internet, so I spent a good deal of time checking out these comments. This much I know, there are always going to be negative comments and the ones I read are pretty typical for the restaurant/hotel industry. And while R feels quite strongly that the inn was in better hands with the previous owners, I know for a fact that once upon a time the former owners' dog ate a good portion of the bottom tier of a wedding cake. And the bride never found out! In my opinion, weddings are the most difficult and stressful functions of all to work. Those Cinderella dreams seldom meet their expectations. And someone has to take the fall. One of the more memorable weddings that took place at the inn involved a huge drunken brawl the night before the ceremony when the future bride and groom's guests threw cell phones, pool furniture, and each other into the pool, and thanks to all the glasses they shattered around and in the pool, it was closed the next day for cleanup. During the wedding reception, underage kids tried to get drinks at the bar and when that failed the grownups tried to smuggle drinks to them. That failed too and the bride and groom expressed their outrage at the bartender for daring to question them. They paid their bill via tons of checks from family and friends and then blew town before most of those checks bounced. A couple of years before I moved away I was given the dubious honor of being in charge of a small wedding between a middle aged minister and his young bride. Being in charge means that anything that goes wrong will automatically be your fault and hitting yourself in the head with a hammer would be much more fun. My fun began when an old woman (guest only) grabbed my arm with her sharp little claw and screeched that I was to stop lighting the candles. The florist had left dozens of tea-lights sitting deep down inside wine glasses etc... and it was our job to light them. She insisted they were going to break due to the heat and it would be all my fault. My assurances that I still had to light them totally pissed her off and she let everyone around her know this. I made sure her table was not one that I was going to serve. The maid of honor (the bride's sister) was in an anxious hot sweat during the whole event and continuously fussed and fretted over the brides train. When I asked her if she wanted a drink she said yes. When I asked her what she wanted to drink, her face was purple with fury as she screamed "Alcohol!" Unfortunately since I was in charge I got stuck with her at the head table. I thought I was home free and then it came time for me to cut the cake and that's when I knew I might have a problem. This was a wedding for about 50 or so people and sitting in front of me was a 12 inch round decorated layer cake. That's it. No back up sheet cake in the kitchen, just this piddly little cake. Now, the way to cut a round cake into many pieces is this; you cut a circle within the cake so that it now looks like a tire with a hubcap. You then slice the outer circle into slices so it now looks like a radiating sun. The leftover inner circle is the last to be cut. I took a deep breath, and feeling just like a surgeon and terrified of making a wrong cut, I got started. I was busy plating pieces as I cut them and was so intent on my job that I nearly jumped out of my skin when someone shouted in my ear, "Oh my God! What are you doing?" I nearly fell into the cake and I swear my heart stopped. It was the groom and he was furious. "Um, cutting the cake?" was my brilliant response which only made him angrier. "I know you're cutting the cake but what is wrong with you?" The mother of the bride had joined him and she was breathing fire too. "Where are the napkins?" he spat at me. Was that all? Relief flooded over me and I happily pointed out that each plate that had been delivered to the tables by my coworkers had a little cocktail napkin included. "Not those napkins!!! Our napkins!" Oh crap. I scrambled around and under the cake table. No special napkins. I apologized profusely but the groom was having none of it. He called me incompetent and irresponsible and demanded that I get extra help. NOW! During his tirade he stepped so close to me I was literally doing a back bend over the cake table and I was terrified I'd fall into it and it would collapse. Once again I apologized for not being able to find their extra special napkins when he stated, "Of course you can't find them, they're in our room!" This was said with so much huffing and puffing and eye rolling from both Groom and Monster-in-law I'm surprised they didn't get dizzy. "You mean you forgot them?" I made the mistake of asking and he went as purple as the maid of honor. "No I didn't forget them!! You're supposed to get them!! Go!! Now!!" While I explained to him that never in my life had I entered a guest's room for a function and that there was absolutely no mention of this on my banquet sheet, Monster-in-law flounced from the room. She returned and slapped the box of napkins on the table. "Now you make sure every one of our guests gets a napkin," he hissed. "Do. You. Under. Stand?" I can't tell you how disappointed I was when upon opening the box to discover not 14 karat gold sheets of paper engraved by reclusive, blind, uncircumcised monks from a monastery deep within some distant poor third world country, but plain old common wedding napkins printed with the bride and groom's names and the date of the wedding. But I made sure every stinking guest got one. Normally, when we cleaned up after a party, but guests remained to socialize, we cleared away everything but their drink glasses. That day I told my co-workers since these napkins were obviously so valuable and everyone was most likely going to take theirs home to frame, they were to leave every one of them behind, even those scattered about the floor and being ground into the carpet by the heels of careless guests. I slunk home that night knowing full well I was going to be fired and I spent a depressing weekend waiting for the phone to ring but it never did. The next week when the banquet manager casually asked me how the wedding went I couldn't believe the groom hadn't tattled on me and when I explained to her what had happened she just laughed! She told me that during the planning of the wedding she'd told the groom that the waitstaff never go into the guest's rooms and it was up to him to make sure everything we needed was in the dining room. I only wished I'd known that ahead of time, at least I would have been prepared. So anyway, can you imagine what kind of review these weddings would have received on the internet? Because I'm sure 'their' story would be a lot different than our story; "he said," "she said," kinda stuff. And both of these events occurred before the new owners took over. I have tons more stories but I'll stop with these. 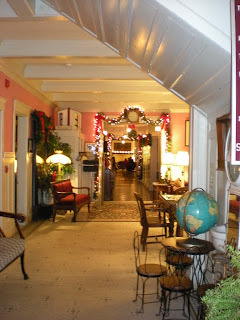 And I also plan on this being my last post about the inn. The Travel Channel's 'Dead Files' and a Blast from my Past. Before last week, I'd never heard of the Travel Channel's series called 'The Dead Files' but I think it must have been via Facebook that I was informed they were airing an episode based in a tiny little town in Pennsylvania about The Riverside Inn. Why this would surprise me so much is because before Hans and I headed south, I had worked at that inn as a waitress for over 10 years. So I taped the show and then forgot about it. Tonight Hans and I finally watched it. The Dead Files is a show that deals with the paranormal and if there was ever a place that has a 'ghostly' reputation, then the Riverside Inn is it. 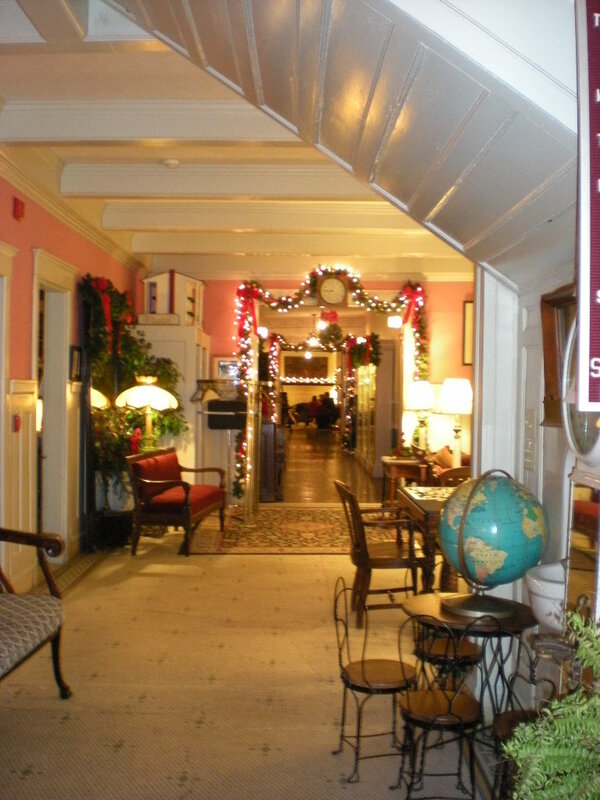 However, when I started working there (I think it was 1999) I knew nothing about the inn's many ghosts and as a single mother of three, I was much more concerned with getting ahead of my bills as I was due to lose my full time job within a few months time. I figured waitressing during evenings and weekends would allow me to do that until I could find another full time job. 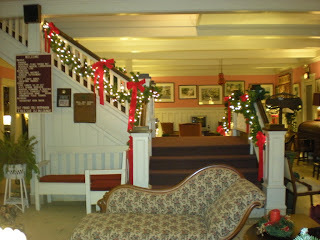 But even after I found a new job I continued to work at the inn for many years. Like I mentioned before, ghosts were not high on my agenda at that time and anyway I had much bigger things to worry about as I was perhaps the worst waitress in the world, and I knew no one wanted to work with me. Actually, I'd have much rather dealt with ghosts than the inn's owner as I was terrified of her. She ran a tight ship and I managed to irritate her beyond belief. Why she didn't fire me I'll never know, possibly she just felt sorry for me. By the end of the season I was not working the main dining room at all and I'd been relegated to finish the year in Dinner Theater. The ironic thing about Dinner Theater is; the money can be quite good, but your waiting skills not so much, and it's really the most desirable shift to be had (during my last year at the inn I only managed to snag one Dinner Theater shift and that was by complete accident). It was during the next to the last night of my first chaotic year at the inn that I experienced my one and only ghostly encounter. 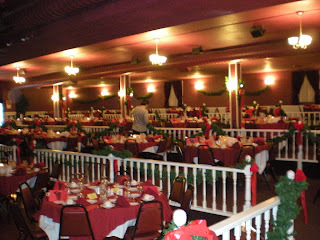 I'd struggled through a busy Christmas lunch shift (I still have to wonder how many orders I managed to screw up) and had headed downstairs to the Victorian Room where Dinner Theater is held. I had plenty of time before my shift so I was able to use the ladies room. I'd piled my belongings on a bench right inside the doorway and after washing my hands and walking back to the bench for my makeup bag, I felt a strange resistance push me back a step. I figured I was just tired which made me wonder how I was going to get through the next six hours. Needless to say all these years later I would never have remembered feeling that resistance if not for what happened next. I was bent over the sink and fixing my makeup when one of the stall doors behind me opened. I was surprised because other than one of the waiters out in the Victorian Room who'd also arrived early, I thought I was alone. The door continued to open wide but from my position at the sink I could see in the mirror that it was empty. No one was there. The stall doors are held closed by a heavy spring similar to those on old fashioned porch doors so they have to be pushed open from the inside. After the door fully opened, it slammed shut so hard it bounced on its spring. I turned around and glanced down to see if maybe a little kid had walked out and I just couldn't see it from the mirror, and feeling a little silly, because no one was there, I said, "Hello?" No answer. So I bent over and looked for feet under the stall doors. Nothing. I carefully opened each door and they were all empty. That's when I left all my belongings behind and went into the Victorian Room to get Mike, the young college kid who was setting up. I made him come back to the ladies room, demonstrated for him what had happened proving to him that in no way could that door have opened on its own, begged him to tell me I wasn't crazy, and demanded he come up with some sort of logical explanation. He just shrugged his shoulders and said it must have been the ghost. He himself had never seen anything unusual but he knew many others who had. In the following years I too heard many ghost stories from my fellow co-workers, some more believable than others. Every year after that I would go into that bathroom and try to discover what exactly could have happened but I never did figure it out. 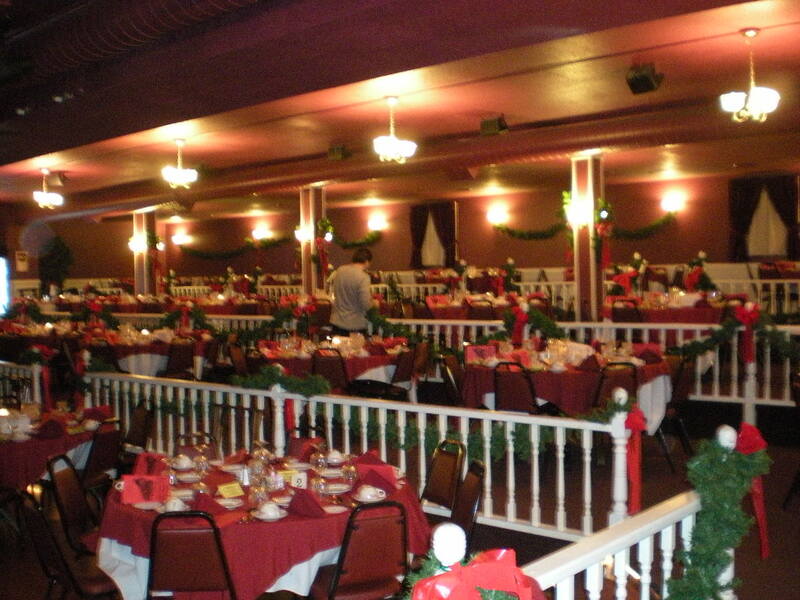 A crappy picture of the infamous Victorian Room where Dinner Theater is held. So, the Dead Files portrayal of the inn came across in a much darker way than I remember it but I'm sure that the macabre sells much better than bathroom doors that open by themselves! The Riverside went up for sale shortly before I moved and I was so afraid no one would buy it and it would fade away as so many of those beautiful historic places do; the upkeep in itself is tremendous. Needless to say I was thrilled when Larry and Brenda Evans bought it; I'd known them for years and they too were afraid the inn would disappear and they've now put their whole lives into maintaining it as it should be. 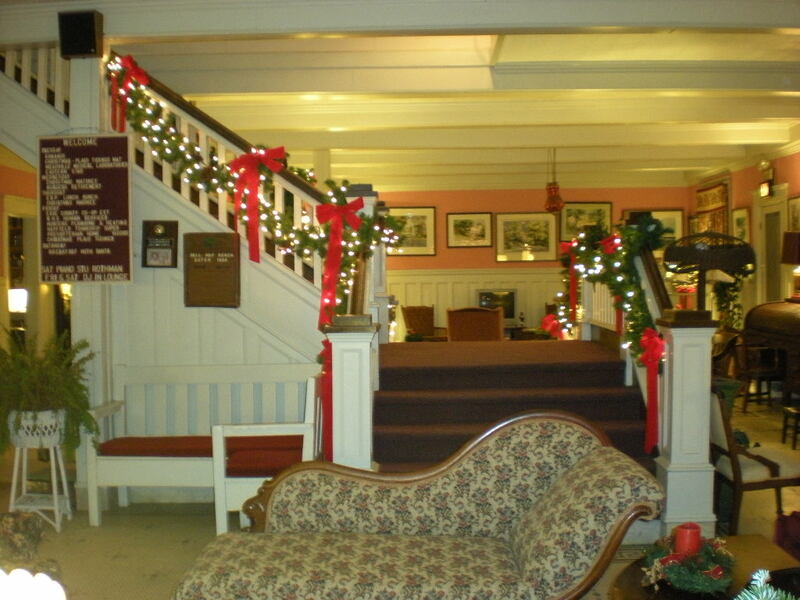 The Riverside is a Victorian Inn complete with a huge wrap around porch, 75 rooms and banquet facilities, is beautifully landscaped and even has the good grace to have a creek that flows right past it. Whether you're there during a busy summer weekend with wedding season in full swing, an autumn where the trees are brilliant with scarlet and orange leaves, or at Christmas when its decorated from top to bottom and the twinkling lights in the shrubbery glow under a blanket of snow, it's a magical place to be. I doubt there are many places like it remaining and if you ever happen to be near Erie, Pennsylvania it's well worth checking into. But if you spend the night you might want to sleep with a light on.